Updated to include more on practical usage and differences across the US; a glossary of American terms for overseas visitors; demystifies common American cultural themes with entertaining explanations; an insightful look at the language of American music, TV and film culture and electronic media. Lonely Planet's "USA Phrasebook" is a great introduction to the American way of life and speaking for foreigners. Whether you are a British tourist going to visit the States, or a person studying English as a foreign language this can be a good guide and reading supplement. Traditionally to Lonely Planet phrasebooks, this one gives you a short and easy-read introduction to the origin and modern state of American English. Then follow the sections dealing with American culture and regional variations. Firstly, authors give you a few hints on pronunciation, grammar, body language, major musts of conducting a conversation, and insults, all of which in a light practical manner. 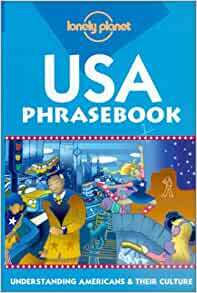 Secondly, the phrasebook is a cultural studies compilation throwing light on different aspects of American way of life, American society and its dos and don'ts. Various sections tell you about family patterns, dating, weather talk, housing, driving, eating and drinking habits, sports, entertainment, musical tastes, political and educational institutions, influences from US culture on English and international life. Other chapters deal with business or gay talk, slang and jargon (military, surf speak, skate talk and psychobabble). Every chapter tries to give a short introduction, but the main content is delivered through explanation of meaning and usage of numerous words, phrases and sentences. The authors inform you of what can be said and heard, of what can be used or should be avoided. There is also a small section on British-American differences, far from comprehensive but enough to start with. It includes some tips for Brits written in such a funny way that you don't know at first whom to feel sorry for, British or Americans. The regional section tells you about regional vocabulary in various parts of the country, with separate chapters on the Ocracoke Island phenomenon, Californian, North-West, Central Plaines, New York, New England, Southern English, on the language of African-Americans, Jews, Spaniards, on Pennsylvania German and Hawaiian English. Then come chapters dealing with some Native American languages: Pueblo, Navajo, Ojibway, Mohawk, Lakota, Cherokee, Hawaiian and others. Here you will find both information about the history and culture of indigenous tribes, as well as lists of common phrases and words. This phrasebook lets you find your way among regional and social varieties, typical words and jargon, geographical and national influences. It will make you understand Americans and their way of life better through the language they speak. Written in a simple language and entertaining manner, while being very informative "USA Phrasebook" is nearly a must-have on your next trip to the States and will certainly be your good companion, which will easily fit in a pocket. 5つ星のうち5.0THIS IS AN EXCELENT BOOK! I DON'T KNOW WHY NOT MANY PEOPLE HAVE BOUGHT THIS ONE, BUT IF YOU REALLY WANT TO UNDERSTAND AMERICANS AND THEIR CULTURE, THEN YOU SHOULD BUY THIS BOOK! This is by far the best resource on decoding the regional, colloquial, or vernacular dialects found in the USA. The booklet is very portable, well organized and low priced. After 17 years of living in the USA (only California), I use this booklet everytime I visit the South or New England States. The phrasebook has a good introduction on the development of the American English dialect, and how culturally ecclectic the US lexicon is. This pharasebook is written mainly for your average tourist BUT is equally pedagogical for the average US citizen.